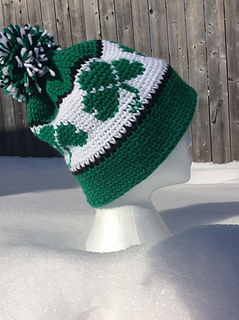 Put the luck of the Irish on and say, ”Happy St. Patrick’s Day” with this theme appropriate hat. 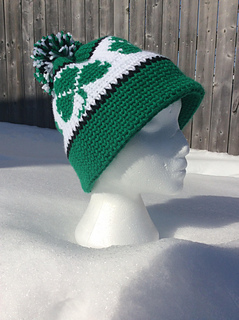 Worked in the knit stitch, this crocheted hat looks like it’s knit! 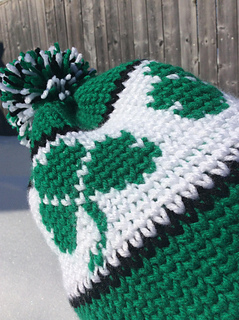 It features a double thick brim for extra warmth. 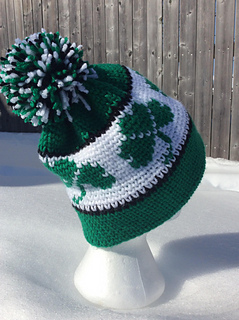 The Handmade pompom on the top brings all the colours together. While working the graph, you may crochet over the non-working yarn, or carry it behind your work. The knit stitch does not have a lot of stretch. If you would like a larger brim for your hat, increase your starting chain by multiples of 4. 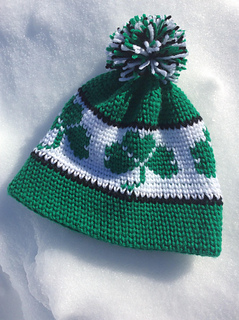 Then for each multiple of 4 you will increase the stitch count space of colour B between the Shamrocks by one. 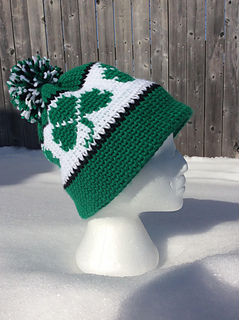 For example, with a chain of 64 the colour B between the shamrocks is three stitches. If you increase the starting chain to 68, the colour B between the Shamrocks will increase to 4 sts. The rest of the pattern will remain the same.